Black & Decker Man Gifts Ad 1960 This is a December 5, 1960 advertisement. It is a nice color ad from Black & Decker. It pictures a Black & Decker Utility Saw, Power driver and saw attachment combination, a jig saw and a finishing sander. These are suggested Christmas gifts for men. In excellent condition. Photo is taken through plastic and may show wrinkles or crookedness that is not in the ad. This magazine tear sheet measures 10 1/4"" wide by 13 3/4"" tall. 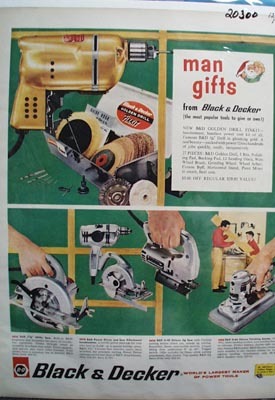 Items Similar To "Black & Decker Man Gifts Ad 1960"